The FlexCom feels completely at home in the city and is ideally suited for cleaning badly blocked pipes and emptying flooded basements, septic tanks and grease traps. 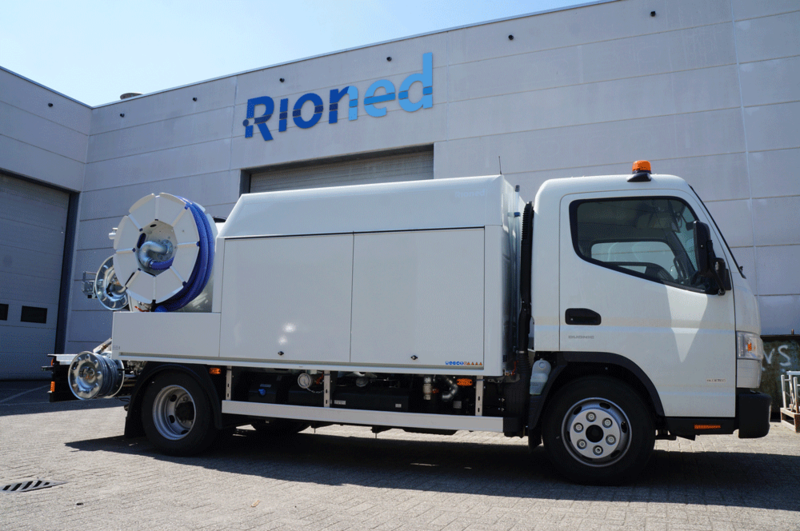 Rioned's popular combination jet-vac unit owes its name to the vast number of tasks for which it can be deployed. A large number of options and pumps are available to facilitate this versatility. For example, you can opt for a sliding partition that allows you to easily change the sizes of the clean and dirty water sections in the tank. This significantly increases flexibility. The FlexCom is built on a 7.5 ton Fuso Canter chassis or on a 10 ton chassis such as the Mercedes Benz Atego. Three new options have now been added to the already extensive range of equipment available for the FlexCom. The new suction hose guide on the FlexCom makes it easier to work with the suction hose on the hydraulic reel. The guide supports the hose during unwinding and the operator only has to pull the hose in the right direction. This also makes it easier to wind the hose back onto the hydraulic reel. We have produced a short video to show you just how easy this is. In addition to ease of use, we have also considered performance. Instead of the standard 5,000 l/min suction pump, you can also opt for a more powerful suction pump with a capacity of 8,200 l/min. Allowing you to complete jobs faster than with the standard pump. The pump is cooled by air injection. Roller shutters have been added to the range as the third new option. Because the FlexCom is often used in busy city streets, customers increasingly request roller shutter doors instead of hinged doors. This helps prevent situations where inattentive cyclists or pedestrians can collide with open doors for the various tool storage compartments. A safe choice, especially when working in the dark! Thanks to compact dimensions with a large capacity, the FlexCom is an extremely cost-effective alternative for a wide range of tasks that would traditionally require the use of larger combination units. The purchase price, maintenance costs and fuel consumption are considerably lower. This combination unit really comes into its own in a busy urban environment, particularly in narrow streets. The FlexCom is available with different jetting pressure capacities and a tank capacity of 3,500 litres. The size of the dirty and clean water sections can be specified by the customer. The jetting hose reel, suction hose reel and rear cover are hydraulically operated for maximum ease of use. The FlexCom comes with a remote control unit so it can be operated by one person. Would you like more information? We will be happy to help. Please contact our sales team.